DSG's first golf vacation in the Fayetteville, N.C. area is proving to be an eye-opener in the best way. The prices are reasonable, the weather is superb and the golf, thus far, has been a joy. 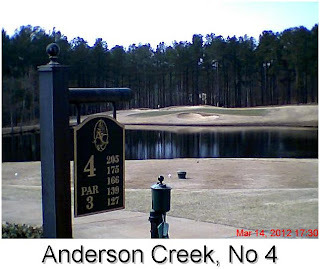 The first round I played was at Anderson Creek Golf Club, an upscale public track that opened on 2001 and was designed by one of North Carolina's favorite sons, PGA Tour veteran Davis Love III. Love's first "signature'' course in his home state is a winner from start to finish. It's got a nice par-4, 360-yard first hole and a stout par-5, 502-yard finishing hole. There are plenty of great holes in between, too, including the par-3 fourth hole that measures 166 yards from the white tee, 175 from the blue and 205 from the black. No matter which marker you use, the tee shot does most of its flying over water. The par-4, 312-yard 13th hole is a nifty driving hole that places great demands on a second shot to a contoured green with a steep false front. Checking my notes from the round, there wasn't a hole on this course that struck me as funky or contrived. Love did a masterful job marrying his design ideas to the lay of the land in the Sandhills region. 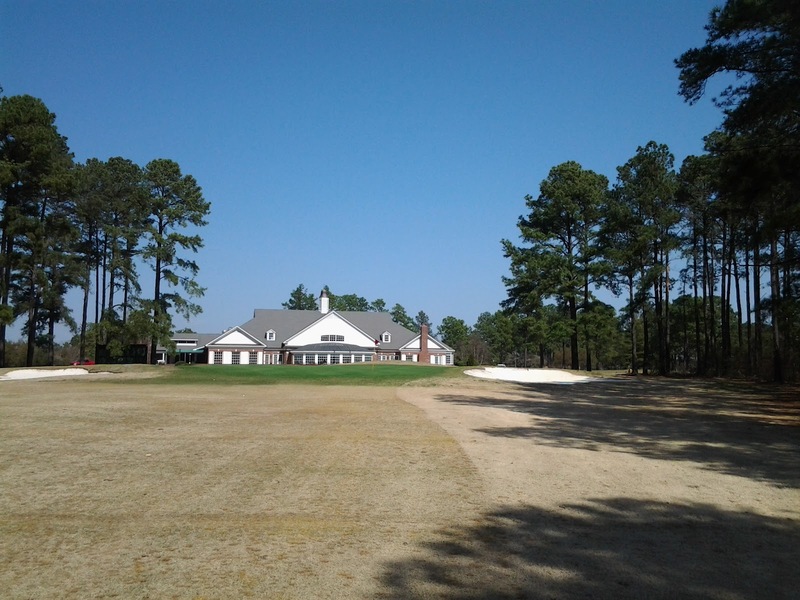 The second of this stop's four planned rounds was played at Gates Four Golf $ Country Club, a semi-private course that is accessible through the stay-and-play packages offered on www.golfontheready.com. Designed by William Byrd and open since 1967, Gates Four is another extremely playable track that tests your game without breaking your spirit. Water comes into play on many holes here, starting with the lake that beckons an errant tee shot on the left side of the par-4, 352-yard second hole. The par-4, 400-yard eighth hole is a serious test. Distance control is at a premium on the par-4, 358- yard 12th hole with water coming into play on the tee shot and approach. Holes 14 through 18 all are stern but fair tests. If you're a big hitter, by all means use the back tee on the par-5, 537-yard hole with its forced carry of 190 yards over water. Thanks to the aforementioned stay-and-play packages, greens fees at both of these courses are within the range of cost-conscious golf travelers who are perfectly willing to pay a little more for a premium experience. Think $45 to $60, allowing for discounts built into the packages. The second picture below is No. 9 at Gates Four.